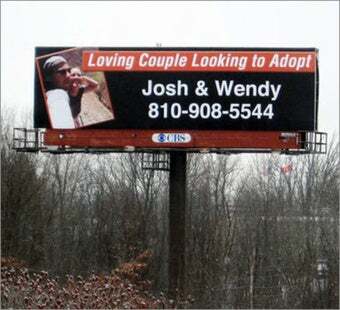 Michiganders Wendy and Josh Rougeau got sick of waiting on the adoption process to deliver up a bundle of joy, so they plunked down $2,000 for this billboard that advertises their baby-wanting. How's it working out? So far, so good! "We've had a lot of contacts in the last 24 hours, so we've taken some good notes," Josh Rougeau told Fox News' Detroit affiliate. Added Wendy Rogeau, "I do kind of jump a little bit every time the phone rings and it's not a number that I recognize, but I try not to get too overly excited." In addition to the billboard, which appears on the I-75 expressway, the couple's also been spreading the word with business cards, flyers, and t-shirts.